National Health Service staff went on a four-hour strike today (Monday) against a pay freeze which has meant one in five of them have had to take other jobs in order to make ends meet. Health Secretary Jeremy Misprint Hunt, whose 10 per cent pay rise on his ministerial salary of around £140,000 is safe, said the health service could not possibly afford to add one per cent to workers’ pay. The minimum starting salary for a registered nurse is £21,478; Hunt’s pay rise alone could cover a one-per-cent increase for no less than 65 such nurses, and they are by no means the lowest-paid NHS workers. The strike has come as The Times newspaper claimed that “senior Tories have admitted that reorganising the NHS is the biggest mistake they have made in government,” with at least £5 billion a year wasted on inefficiencies. The paper’s online version is hidden behind a paywall, but its front page states: “David Cameron did not understand the controversial reforms and George Osborne regrets not preventing what Downing Street officials call a ‘huge strategic error’, it can be revealed. “The prime minister and the chancellor both failed to realise the explosive extent of plans drawn up by Andrew Lansley, when he was the health secretary, which one insider described as ‘unintelligible gobbledegook’. The report raises several questions. Firstly, if Lansley’s reforms were a mistake, that doesn’t mean Cameron and Osborne would have proposed anything better. Tories are almost universally dedicated to the end of the National Health Service and the worsening of working-class health. Secondly, if David Cameron did not understand Lansley’s plans, why did he allow them to go through? As Prime Minister, he is responsible for the activities of his government and a lack of comprehension indicates that he is not fit for the role – and never was. Is it possible that Cameron was swayed by the fact that Lansley was his mentor at the Conservative Research Department and he thought he owed a favour? Finally, and perhaps most importantly: How did the government let the NHS fall into this terrible condition? For the answer, we have to go back, again, to the Coalition Agreement. The Government believes that the NHS is an important expression of our national values [From this we may conclude that the Tories (and their little LD friends) decided to change the NHS and make it reflect their values]. We are committed to an NHS that is free at the point of use and available to everyone based on need, not the ability to pay [Fail]. We want to free NHS staff from political micromanagement [Fail], increase democratic participation in the NHS [Fail] and make the NHS more accountable to the patients that it serves [Fail]. That way we will drive up standards, support professional responsibility, deliver better value for money and create a healthier nation [Fail]. We will guarantee that health spending increases in real terms in each year of the Parliament, while recognising the impact this decision will have on other departments [Vox Political has just spent several weeks demonstrating to the BBC that this has not happened]. We will stop the top-down reorganisations of the NHS that have got in the way of patient care. We are committed to reducing duplication and the resources spent on administration, and diverting these resources back to front-line care [Andrew Lansley’s Health and Social Care Act 2012 was the largest top-down reorganisation ever imposed on the National Health Service. It was also gibberish (as top Tories now concede) and has cost the service more money than it could ever hope to save]. We will significantly cut the number of health quangos [Clinical Commissioning Groups are quangos – so in fact it seems likely the number has increased]. We will cut the cost of NHS administration by a third and transfer resources to support doctors and nurses on the front line. We will stop the centrally dictated closure of A&E and maternity wards, so that people have better access to local services [The Coalition government has never – let’s have that again: NEVER – refused permission for a plan to close A&E wards]. We will strengthen the power of GPs as patients’ expert guides through the health system by enabling them to commission care on their behalf [This refers, again, to CCGs. In fact, overworked GPs do not have time to plan and commission services, and have handed responsibility over, in most cases, to private health companies. This has opened the way for a huge amount of corruption, as these companies may commission services from themselves. More than one-third of doctors who are board members of CCGs have financial interests in private healthcare (NHS SOS, p 5]. We will ensure that there is a stronger voice for patients locally through directly elected individuals on the boards of their local primary care trust (PCT). The remainder of the PCT’s board will be appointed by the relevant local authority or authorities, and the Chief Executive and principal officers will be appointed by the Secretary of State on the advice of the new independent NHS board. This will ensure the right balance between locally accountable individuals and technical expertise. The local PCT will act as a champion for patients and commission those residual services that are best undertaken at a wider level, rather than directly by GPs [Fail. This hasn’t happened]. It will also take responsibility for improving public health for people in their area, working closely with the local authority and other local organisations [Fail]. If a local authority has concerns about a significant proposed closure of local services, for example an A&E department, it will have the right to challenge health organisations, and refer the case to the Independent Reconfiguration Panel. The Panel would then provide advice to the Secretary of State for Health [Fail. The right to challenge seems to have been introduced but has been ineffective]. We will give every patient the right to choose to register with the GP they want, without being restricted by where they live [Fail. In fact, the Coalition has given GPs – or rather, CCGs – the right to choose the patients they want, meaning they can exclude patients with expensive, long-term conditions. This has an effect on the promise to provide care to everyone that is free at the point of use, of course]. We will develop a 24/7 urgent care service in every area of England, including GP out-of-hours services, and ensure every patient can access a local GP [Fail, for reasons indicated above]. We will make care more accessible by introducing a single number for every kind of urgent care and by using technology to help people communicate with their doctors [The service was launched in 2013 and was a complete and utter failure – it could not cope with demand on any level]. We will renegotiate the GP contract and incentivise ways of improving access to primary care in disadvantaged areas. We will make the NHS work better by extending best practice on improving discharge from hospital, maximising the number of day care operations, reducing delays prior to operations, and where possible enabling community access to care and treatments. We will help elderly people live at home for longer through solutions such as home adaptations and community support programmes. We will seek to stop foreign healthcare professionals working in the NHS unless they have passed robust language and competence tests. Doctors and nurses need to be able to use their professional judgement about what is right for patients and we will support this by giving front-line staff more control of their working environment. We will strengthen the role of the Care Quality Commission so it becomes an effective quality inspectorate [The CQC has been rocked by the revelations of one cover-up after another, involving physical and psychological abuse of clients]. We will develop Monitor into an economic regulator that will oversee aspects of access, competition and price-setting in the NHS [Monitor has been turned into the enforcer of the government’s privatisation initiative]. We will establish an independent NHS board to allocate resources and provide commissioning guidelines [This is NHS England, which now takes decisions that would once have been in the hands of doctors. It can intervene in the running of any CCG, forcing changes where they don’t fall into line. It rigidly enforces spending limits]. We will enable patients to rate hospitals and doctors according to the quality of care they received, and we will require hospitals to be open about mistakes and always tell patients if something has gone wrong. We will measure our success on the health results that really matter – such as improving cancer and stroke survival rates or reducing hospital infections. We will publish detailed data about the performance of healthcare providers online, so everyone will know who is providing a good service and who is falling behind. We will put patients in charge of making decisions about their care, including control of their health records [Jeremy Hunt wanted to sell your health records to private companies. Although the scheme was put on hold in February 2014, it seems to be running now. Your health records may already be in the hands of private companies]. We will create a Cancer Drugs Fund to enable patients to access the cancer drugs their doctors think will help them, paid for using money saved by the NHS through our pledge to stop the rise in Employer National Insurance contributions from April 2011. We will reform NICE and move to a system of value-based pricing, so that all patients can access the drugs and treatments their doctors think they need. We will introduce a new dentistry contract that will focus on achieving good dental health and increasing access to NHS dentistry, with an additional focus on the oral health of schoolchildren. We will provide £10 million a year beyond 2011 from within the budget of the Department of Health to support children’s hospices in their vital work. And so that proper support for the most sick children and adults can continue in the setting of their choice, we will introduce a new per-patient funding system for all hospices and providers of palliative care. We will encourage NHS organisations to work better with their local police forces to clamp down on anyone who is aggressive and abusive to staff. We are committed to the continuous improvement of the quality of services to patients, and to achieving this through much greater involvement of independent and voluntary providers [Fail. The introduction of independent (read: private companies) and voluntary providers has been a costly disaster]. We will give every patient the power to choose any healthcare provider that meets NHS standards, within NHS prices. This includes independent, voluntary and community sector providers [Not true. The patient never has a choice]. The comments (in bold, above) relate only to a few of the calamities that have been forced on the NHS by the Coalition government (you may be aware of others) – and it is important to add that these took place only in England, where the Coalition has control. Health in Scotland, Wales and Northern Ireland is a devolved responsibility but the Tories and Liberal Democrats have tried to influence the provision of services by restricting the amount of money available to the other countries of the UK. In addition, fears are high that the proposed Transatlantic Trade and Investment Partnership between the European Union and the United States of America will “lock in” the privatisation of health services, as corporations will be allowed to sue national governments if they impose changes that would affect a company’s profits. These claims have been rubbished by the European Commission and Tory ministers – but they would, wouldn’t they? In summary: The last four and a half years have witnessed a sustained attack on the National Health Service in the United Kingdom, by a government that won most of its votes on a claim that it would protect and strengthen that organisation. It was a lie that has caused misery for millions – and is likely to have cost many, many lives. providing the best political analysis! Danger of abuse in the health service is not in the way that ordinary people use the service. Abuse is always at the point where private commercialism impinges on the service – where an attempt is made to marry the incompatible principles of private profit with public service. The solution is to decrease the dependence on private enterprise. A free health service is a triumphal example of the superiority of the principles of collective action and public initiative against the commercial principle of profit and greed. The first guiding principle is this: maximise competition …..which is the primary objective. 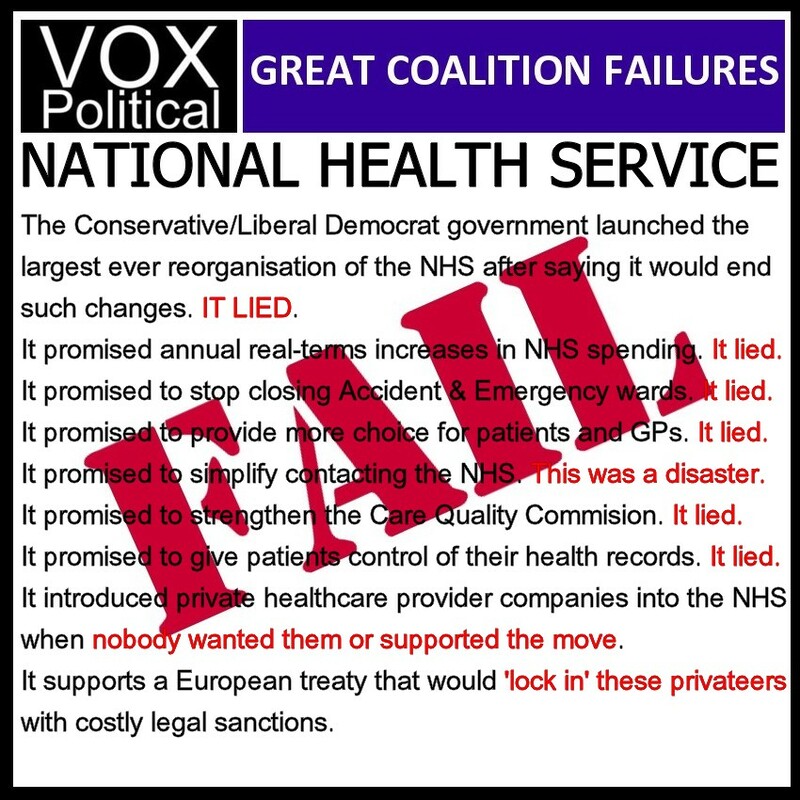 The Coalition Government passed into law an unprecedented assault on the NHS. Doctors, unions, the media, even politicians who claimed to be stalwart defenders failed to protect it. Now the effects of those devastating reforms are beginning to be felt by patients – but we can still save our country’s most valued institution if we take lessons from this terrible betrayal and act on them. This is the wrong action what should be done is a concerted work to contract, which means the staff would not lose monies but the shortcomings of the whole management system of the nhs would be highlighted, and after all why should health care staff be denied a raise as in the nurses case was recommended by the independent body of 1% when the mp’s claimed they had to take the 11 ½% their independent board recommended.